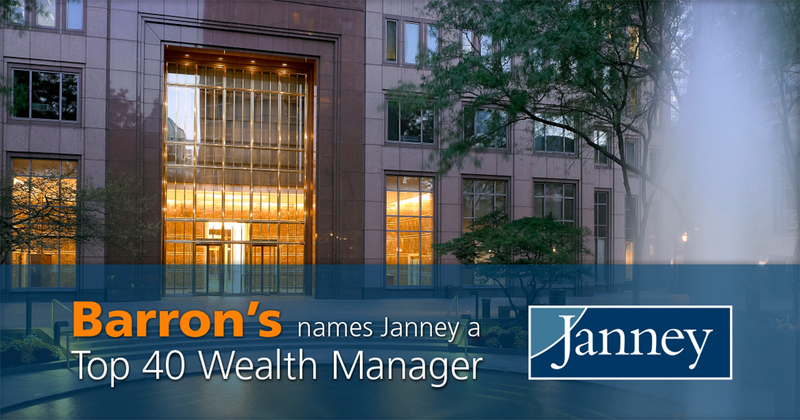 PHILADELPHIA, PA – September 19, 2016 – Janney Montgomery Scott LLC (“Janney”), a leading full-service wealth management, financial services and investment banking firm headquartered in Philadelphia, Pa., today announced that the firm has been named to Barron’s 2016 list of “Top 40 Wealth Managers,” published September 17, 2016. The list, published in the latest edition of Barron’s quarterly PENTA publication to high net-worth investors, ranks Janney as one of America’s largest wealth management firms by assets under management in accounts of $5 million or more, as of June 30, 2016. This is the fifth time Janney has been named to this prestigious list. Janney provides advice to individual, corporate and institutional clients. Our expertise includes guidance about asset management, corporate and public finance, equity and fixed income investing, equity research, institutional equity and fixed income sales and trading, investment strategy, financial planning, mergers and acquisitions, public and private capital raising, portfolio management, retirement and income planning, and wealth management. Janney is an independently-operated subsidiary of The Penn Mutual Life Insurance Company and is a member of the New York Stock Exchange (NYSE), Financial Industry Regulatory Authority (FINRA) and Securities Investor Protection Corporation (SIPC). Additional company information is available at www.janney.com.